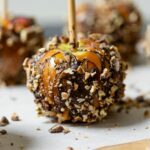 Sprinkled with toffee pieces and chopped pecans, these Homemade Caramel Apples are the perfect Halloween treat! They’re a bit of sweet, salty and just so good! In a large kettle, combine the sugar and water. Swirl the pan to moisten all the sugar. Place over medium heat and bring to a boil. Swirl the saucepan periodically to ensure the sugar is evenly heating. Once at a boil, continue to cook until the sugar has reached a deep amber color, about 310 degrees. Remove from heat. While whisking the caramel, slowly pour in the cream. The sugar will bubble vigorously. When all the cream is added, continue to whisk until smooth. If the caramel seizes at all, place over low heat and stir until smooth. Off the heat, add the salt and vanilla. Whisk and pour into a heatproof bowl to cool. At the stem end, pierce each apple with a stick to create a handle. When the caramel is room temperature and thickened, melt the chocolate in the microwave. Heat for 30 seconds, stir and heat again. Continue until just melted. Dip the apples in the cooled caramel and set on a parchment-lined baking sheet. If the caramel seems low for the last apple, spread it on and allow it to drip down until coated. Drizzle the chocolate over the caramel and sprinkle with nuts and toffee. Dip the bottoms of the apples in nuts and toffee to ensure they don’t stick to the parchment.